“Now there are varieties of gifts, but the same Spirit. And there are varieties of ministries, and the same Lord. There are varieties of effects, but the same God who works all things in all persons. But to each one is given the manifestation of the Spirit for the common good” (1 Corinthians 12:4-7, NASB). If you don’t know if you have a spiritual gift or not, then I’m here to tell you that you do! If the Holy Spirit dwells in you, then you have a spiritual gift! But, if you don’t know what that gift is and/or you aren’t using it, then it’s kind of like saying “no thanks” to God for the gift. Sometimes we know what our spiritual gift is and just don’t like to admit it because it somehow relieves us of the responsibility of exercising it. And, then there are those of us who just haven’t really thought about our spiritual gift. After all, isn’t that what my pastor and Sunday School teacher are supposed to have? Don’t be a spiritually ungrateful Christian! God has given you a gift, maybe several. Know what your spiritual gift is and exercise it! There are several lists of spiritual gifts recorded in the New Testament. In 1 Corinthians 12 the Apostle Paul designates the following gifts: giving a specific word of wisdom (from God), speaking a word of knowledge (about God or His will), having faith, performing healings, working miracles, prophesying, distinguishing spirits, speaking in tongues, and interpreting tongues. Later in Chapter 12 Paul includes another list of gifts: apostles, prophets, teachers, miracles, healings, helps, administrations, and tongues. This list seems to be a more like a hierarchy of spiritual gifts and the functional roles in the Church in which they are manifested. In Romans 12:5-8 Paul lists prophecy, service, teaching, exhorting (preaching), giving, leading, and showing compassion. And in Ephesians 4:11 he mentions apostles, prophets, evangelists, pastors and teachers. 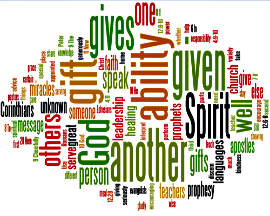 Peter mentions speaking and serving (1 Peter 4;10-11) as spiritual gifts. Granted, some of these lists may identify gifts or even classifications of gifts and some may identify offices or roles in the Church that are the result of being endowed with certain spiritual abilities. And these lists may not be exhaustive. But, these lists indicate that there are a variety of special skills that God gives and the Holy Spirit works through to grow and strengthen God’s people collectively. One of the first examples of God granting spiritual gifts was in the second book of the Bible. The book of Exodus describes how God granted Bezalel the ability to work as a skilled craftsman to construct the Tabernacle (Tent of Meeting) and make all its furnishings: “I have filled him with the Spirit of God in wisdom, in understanding, in knowledge, and in all kinds of craftsmanship, to make artistic designs for work in gold, in silver, and in bronze, and in the cutting of stones for settings, and in the carving of wood, that he may work in all kinds of craftsmanship” (Exodus 31:3-6). Maybe you don’t have the gift of healing or miracles; maybe you’re not a prophet or teacher or evangelist. But, maybe you are an artisan or craftsman. Maybe you have mechanical skills. Whatever special skill or ability God has granted you, He has enabled you for the “common good.” So, you should exercise your spiritual gift to grow and strengthen the Church. God empowering people is the way He works His will in this world. So, if you haven’t been exercising your spiritual gift, please find out what it is and start using it because we need your help! God wants your help! This entry was posted in spiritual gifts and tagged Bible, spiritual gifts. Bookmark the permalink.